Usain Bolt has renewed his sponsorship deal with kit-maker Puma until after the 2016 Games in Rio de Janeiro. Jamaican Usain Bolt, 27, has been with Puma since 2003, and last renewed what is considered to be the biggest sponsorship deal in athletics in 2010. The Olympic champion said he was proud to continue with Puma “for the years ahead”. Usain Bolt had earlier indicated he may retire after the 2016 Games, but recently said he may compete for a year after that. There was no mention in the Puma announcement about any retirement plans. Usain Bolt has won six Olympic gold and eight World Championship gold medals to date. In addition, his time of 9.58 seconds in the 100 metres is the fastest run to date. 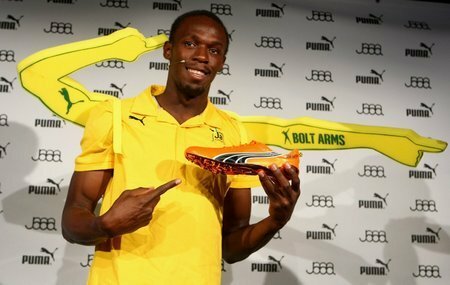 Puma chief executive Bjoern Gulden said the firm had supported Usain Bolt since he was 16. “He will play a crucial role in our future product concepts, as well as brand communications leading towards the Olympic Games in Rio 2016 and beyond,” Bjoern Gulden added. In addition to its contract with Usain Bolt, Puma has a longstanding commitment to Jamaican Track & Field. The deal is a boost for Puma as it continues to take on bigger sportswear rivals Adidas and Nike.